Yep, a lot of controversy about those "round versus rectangular headlights". I remember an ad in OUTSIDE Magazine mentioning something about: "a Jeep is not true to its origin if it doesn't have round headlights". Not to debate on your '95 YJ rig (Editor: Rafael is referring to my YJ with the rectangular headlights), but I´ll say it straight forward...I bought my '98 Jeep Wrangler (photo above) because of that specific icon detail, among others. It just caught my eye when the Wrangler came out again with round headlights (in 1997). Mine was forest green, black soft top, four cylinder, although automatic. I had it for about 3-years. 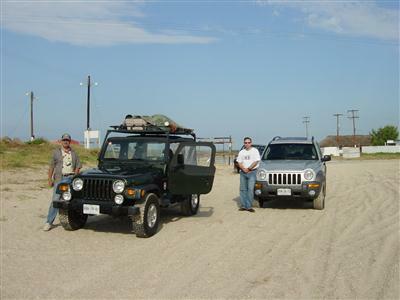 The picture of it above is from around 2004 with a friend who had a Jeep Liberty. We were down by the beach at the Gulf of Mexico. In a way, I can cheer-up about square headlights which are fine in my white Cherokee XJ. I have no quarrel about that, for these complete the full XJ story since its beginnings in 1984. When the XJ was replaced (the 2001 was the last year) and the "Liberty" took its place in 2002. See one in the photo of my friend's above. I did not approve of round headlights for this new line. I have thought that these headlights did not appeal to the Liberty model. Awful if I may say! A too stocky vehicle that wasn't as strong as the XJ...with round headlights??? Please redesign! My comment! One thing is for certain...you can always tell a YJ from a CJ, TJ or JK. Also, I like the simplicity of the leaf springs on all four corners. By the way, the Jeep "Liberty" badge is no longer available in the USA.